Most Seattlites are eagerly awaiting the day that Spring decides to show up in the Great Northwest and with the recent stormy weather, that day isn’t coming soon enough. 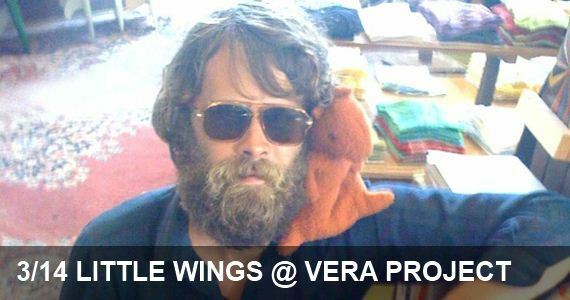 If you’re looking to instantly transport yourself to a lazy, sunny afternoon in the backyard, we recommend visiting the Vera Project tonight to hear the Californified musical stylings of Kyle Field and his band, Little Wings. Kyle has taken the stage with other acts we love, like Grandaddy and Devandra Banhart, and he weaves easygoing SoCal sentiment into lo-fi folk songs, creating the perfect summer soundtrack. Tonight Little Wings is celebrating the release of their next album. Little Wings will be joined tonight by Portland’s White Rainbow, aka Adam Forkner, who has equally impressive chops in the realm of psychadelic-ambient-electornic.